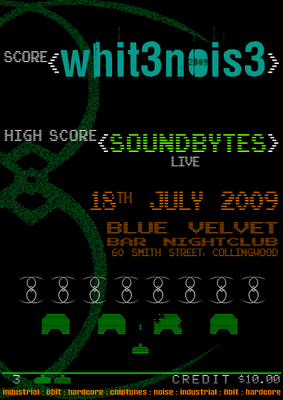 Melbourne institution whit3nois3 is back and ready for battle. Enemy lines have been drawn for a one night Battle Royal, facing off against the insurgents, Soundbytes. For the creatures of the night who love dark, grinding noisy noise you wont be disappointed. So bring your lo-tech arsenal and choose your allies wisely, for there can be only one. Retrotech soldiers such as DOT.Ay, 10k Freemen & Their Families and Celsius will be fronting the assault. $10 will get you unlimited plays. OMG two gigs in a row? Two more pieces of news.